Last Saturday, I was out with relatives rather than gaming (sigh!) but I was pleasantly surprised to end up sheltering from the inevitable rain in the Discovery museum in Newcastle (upon Tyne). They have a gallery of Armour,Weapons and pictures celebrating the Scots Covenanter attack on Newcastle during the English Civil War at present. Much to my surprise and delight, they also have Oliver Cromwells death mask, warts and all! Sorry they arent the best pics, The exhibits were in glass cases and the area was dark! Hope you find this interesting? I have just redone the points system in the Medieval Skirmish rules used in the game below! I did the last version in an attempt to steer players into choosing more typical troop types armoured in a typical way. This was a mistake! - I have realised the points system did not work so well for some lesser known forces, so I have simplified it and made the points more relative to my perceptions of how good the figures are in a game. I hope this works, and I humbly apologise for my gross error!! If you feel you need anything else adding or changing, in any of my rules, please contact me! War is hell, isn't it! Sir Richard Percy stood watching the low, rolling ground ahead of him. Despite the smell and noises of his retinue men around him, Richard could still, just, make out the tell-tale clanking of the Nevilles coming down the valley. Richards own men were mostly from his personal retinue, and well armed. several times they had bested the Nevilles, but the Retinue had shrunk since the last battle to provide forces elsewhere. The main Neville force seemed to be going for De Lacy, hmm,-- plenty of lightly equipped archers and Scourours, with a fair number of Billmen. De Lacy would probably need some help. De Lacy sent some archers into the valley, - Richard could do nothing but watch in horror as dozens of clothyard shafts decended like so much snow and slew several of Hughs men. The Yorkists had deployed against the hill De Lacy was on, and made the most of the opportunity to shoot. The remaining De Lacy men gratefully took cover behind their hill, shaken by their first experience of an arrow storm. Sir Laurence Catterall, leading the Yorkists against Richard, split his forces against both the Percies on the hill and those Richard had placed in a wood at the valley head. Seeing De Lacy lose his archers, and seeing a lot of shooting going into his archers in the woods, Richard withdrew his men into cover, rather than fight an uneven fight in the Nevilles favour. Sir Laurence had pulled back himself to the edge of some woods having taken little damage from the long range Percy shooting.but seeing the Percies fall back began again to advance. The De Lacy forces, having regained their composure, now moved further up their hill - being careful to stay out of sight of their archers! 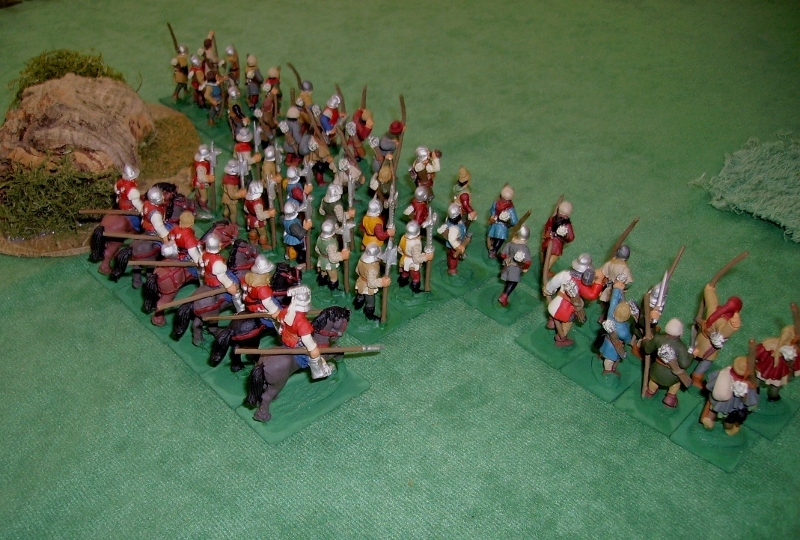 Sir Richard himself,-in cover- moved to the front of his archers position to await the Nevilles advance. Sir Richard advanced his archers to shoot, splitting his fire against both bodies of the enemy. 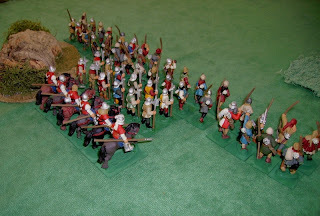 De Lacys crossbowmen, having fought bravely but caused little hurt, rejoined the fight. ...Which Sir Richard personally countered with a ferocious charge. The fight was fierce and confused. While overhead the archers on both sides engaged in a fierce and bloody exchange of arrows. They retired from the field, covered by their remaining archers, and the cavalry, which had done nothing but stand and watch the battle. Sir Laurence, who belatedly had neared the melee his billmen were losing, decided to break off when he saw his ally retreat. The Percies did not pursue, Sir Richard was exhausted after fighting in the melee, and was still weak after his wound in the last battle. He was heartened, however, to see the retreating Yorkist leaders apparently arguing and threatening each other as they withdrew! Einars little band of fugitives are trying to escape a vengeful Gunnar, who is trying to get blood-vengeance for a murder by Einar Scumbagga. Einar is on a headland, awaiting a ship to escape from the pursuit, he needs only a couple of weeks before the license to kill him (1 year) expires. Gunnar has located Einar, thanks to an informer, and has cut off the headland. he and his sea wolves. Hope you liked it? -- I did this one very different - in the style of an epic Viking poem! But as you can see-I am no Skaldir!! in more of our war-games!